In this module you will learn how to use the Infographic Designer Custom Visual. The Infographic Designer give you the ability to make your reports tell a story and even theme the visuals to be more relevant to the topic of your data. Allows you to customize the appearance of report to your specific topic. You can use either the provided shape graphics or import your own SVG shape files. Has the ability to layer images, shapes or text on a single visual. 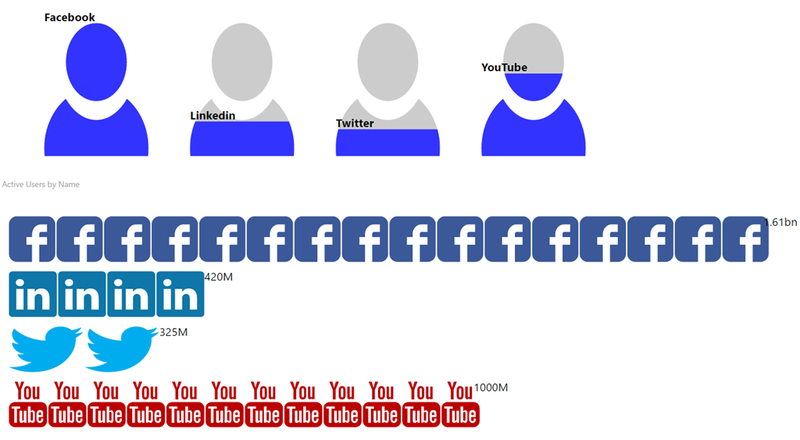 This Infographic Designer is visualizing the monthly usage of different social media platforms. The top visual shows a default shape but the bottom visual with the logos were imported from custom shape files. Most of the magic of the infographic happens by selecting the Pencil icon within the visual. This launches the Mark Designer. Watch the video to learn more about this. Under the Format paintbrush there is really only one section to modify the format. 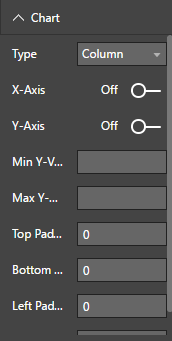 Under the Chart section there are several properties available that can adjust padding, turn on/off chart guidelines, and turn on/off the axis labels. You can also change the type of chart between Column, Bar, and Line here.